The most obvious boom-or-bust prospect in this draft, Josh Allen is a prospect underpinned by the NFL’s faith in potential. His overall PFF grade last season was just 73.6, more than 20.0 grading points lower than Baker Mayfield and good enough to rank just 55th in the draft class. The year before that however, his grade was 84.7, which was good enough to rank 13th. Even just that two-year span speaks to the high-variance in Allen’s play, even in college. Allen can make big-time throws and has unquestionably the best arm strength of the draft class, but he also misses far too many routine throws that hurt his efficiency. It is true that the design of the Wyoming offense did nothing to help his numbers, as he had a lower number of easier screen passes (20.2 percent of Baker Mayfield’s pass attempts were screen plays in 2017), but his tape is still littered with many basic inaccuracies on easy passes that weren’t screens. Allen was at fault for 20.6 percent of his incompletions in 2017, which was more than double the amount for Mayfield. Even adjusting for screens, Allen’s a dramatically more inaccurate passer than the other top prospects in this draft. 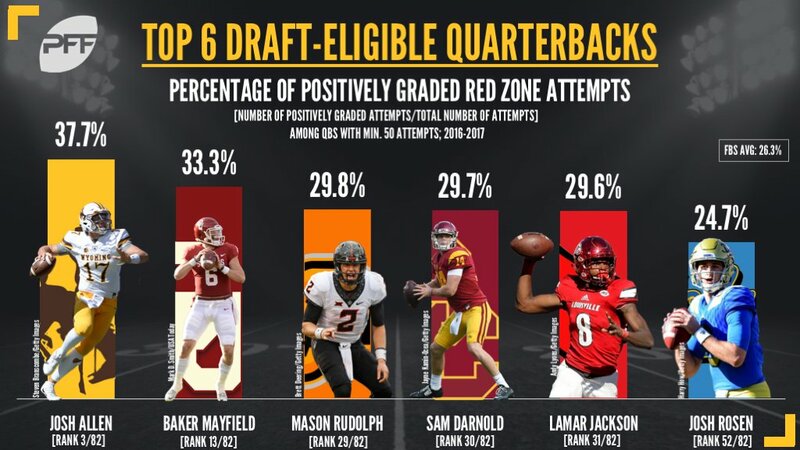 Inaccuracy isn’t always a constant, and players have improved it in the NFL or simply offset it with big plays, either of which is possible for him, but if he can’t do that, he may have a far higher bust potential than the other top prospects who have a higher baseline of passing. This is not a good draft for edge rush talent, and it wasn’t a good free agency period for it either, so this draft may see some players selected higher than they would in another year. In 2016, Key had 12 sacks, 13 hits and 29 hurries, but that came before bailing on the team before spring practice only to return and underwhelm in 2017. Last season, he generated just 28 total pressures, 26 fewer than the season before, and struggled through injuries. Key also weighed in at 238-pounds at the combine despite standing 6-foot-5 in height. That is an alarming lack of bulk for a player hoping to see extensive time as an edge defender at the next level. As much as undersized pass-rushers have excelled in the past, they have typically been shorter players whose lack of overall mass is offset by being tightly packed and compact body types. There are multiple red flags surrounding Key, but his 2016 pressure production was fantastic and in a draft without many truly talented edge rushers, he represents an interesting gamble for a team needing to address that hole in the roster. 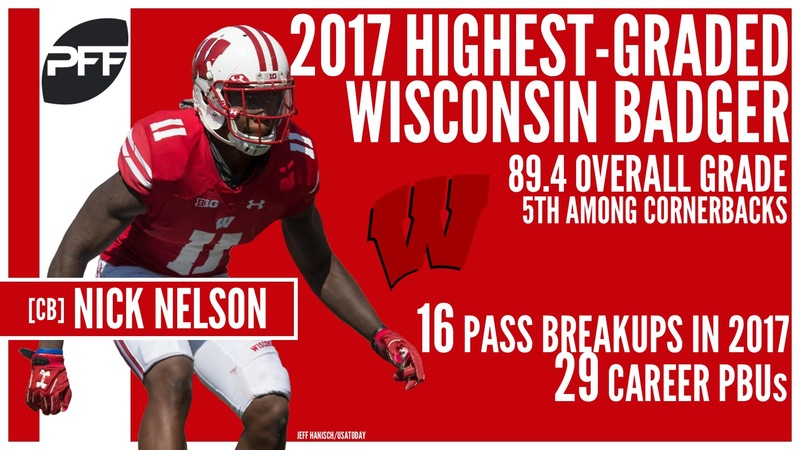 Nick Nelson’s 2017 tape at Wisconsin was fantastic, and he is one of the most impressive prospects at the position in this draft. He allowed just 37.7 percent of passes thrown into his coverage to be caught by receivers he was covering and allowed just 327 yards all season despite seeing the ball come his way 69 times. He also broke up 16 of those incompletions. What is concerning is that this was his only strongly graded season, and the two previous seasons of grading we have on him come from his time at Hawaii, where the strength of competition should have been significantly lower. His overall PFF grade in 2017 was 89.4, but that was more than 15.0 points higher than either season at Hawaii. His entire college career also features no interceptions, which is notable. Interceptions are far from the end all, be all in coverage and can actually often paint an inaccurate picture of a player, but to fail to register a single pick over three seasons of play is unusual, especially when that same span featured 210 targets and 29 pass breakups. Playing a lot of man coverage will inherently lead to fewer interception opportunities than players who play in zone heavy schemes and can eye the quarterback, but if Nelson isn’t going to register turnovers, then the occasional big play he gives up is a bigger problem. In each season of his career, he was beaten for a catch at least 63 yards in length, with two of those years featuring catches of 75-plus yards. Nelson’s 2017 season was fantastic, and his potential is great, but the concerns are there for him to fail to realize it at the next level. Tyrell Crosby was a physical force at Oregon, relying on a size and strength advantage to overwhelm defenders at the point of attack. It worked to an impressive degree and he had two seasons with an overall PFF grade of 85.0 or better, and he ended last season at a career-best mark of 87.3. Crosby allowed just seven total pressures across 13 games and was a force in the run game. The problem is, for a player who relied so much on size and strength, he tended to absorb defenders rather than overpower them and drive them out of the hole, which may call into question his biggest strength at the next level. As good as his pass-blocking numbers were, they were skewed by the system at Oregon where the quick pass was king. On average, the ball came out of the quarterbacks hands in under 2.5 seconds at Oregon last year. At the Senior Bowl, Crosby did well against almost everybody, but struggled against Oklahoma’s Ogbonnia Okoronkwo, a smaller edge rusher who was able to get Crosby off balance and work under his typical leverage. The NFL isn’t stacked with smaller pass-rushers, but there are plenty of players that can target that weakness and exploit leverage mismatches to expose Crosby more as a pass blocker. Big tackles bring an inherent tension between the positives that size brings and the negative side effect that size typically has on movement skills and agility. Crosby’s tape and numbers are impressive, but there will be concern about his capability of replicating it at the next level. 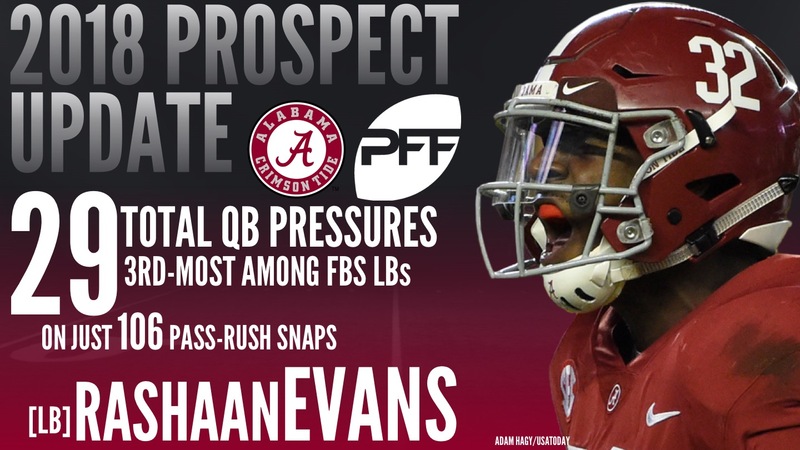 There are few linebackers with the physical ability of Alabama’s Rashaan Evans, who is generating first-round consideration largely off the back of this potential. To date, his tape has been nowhere near comparison to the best linebackers in this class. Evans attacks blocks with violent intent and against the run he has been solid, but this is a passing league and his ability in coverage is at best questionable at this point. At Alabama, he has played both inside linebacker and outside, and that has led to a rare skillset on the blitz as a pass-rusher. Early in his career, he rushed the passer almost exclusively on passing downs, with just 15 total snaps in coverage over his first two years but when he moved to inside linebacker, he had to survive in coverage. His ideal NFL fit may be similar to that of a Dont’a Hightower kind of player – one that plays the run well, can destroy backs and tight ends on the blitz as a pass-rusher, and then all he needs to do is hold up just enough in coverage to hide within the scheme the other 30 percent of his snaps. Given his inexperience, it’s also possible that Evans improves dramatically in coverage and becomes an all-around linebacker, but it’s equally possible that his glaring weakness may torpedo him, as it is the single most important facet of today’s game for his position.